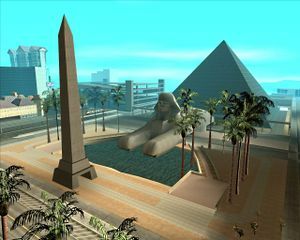 The Camel's Toe Safehouse is a hotel suite located within The Camel's Toe hotel and casino on The Strip, Las Venturas in Grand Theft Auto: San Andreas. Carl Johnson, the player character, can purchase the hotel suite for $6,000. The suite does not come with a garage and vehicles can not be stored there.